This vintage real photo postcard features pretty French performer Bleuette D’Artois. She is beautifully dressed. In fact, she appeared in a postcard series called “Queens of Fashion”. The postcard was published by E.L.D. (E. Le Delay), a company located in Paris, France. The postcard is part of a series (no. 4264). The postmark is dated 1918 and the postcard was postmarked in Merbes-le-Château, Belgium. The postcard has a Belgian stamp. This cabinet card is a portrait of four men sitting around a table drinking beers. The men are wearing dress clothing as they enjoy happy hour at the studio of Axel M. Turnquist, in Eveleth, Minnesota. One of the men is drinking out of a glass, while the other three prefer to imbibe straight out of the bottle. The reverse of the card has a notation indicating that the subjects in the photograph are members of the “Nelson” family. To view other photographs by Turnquist, and learn some biographical facts about him, click on the category “Photographer: Turnquist”. 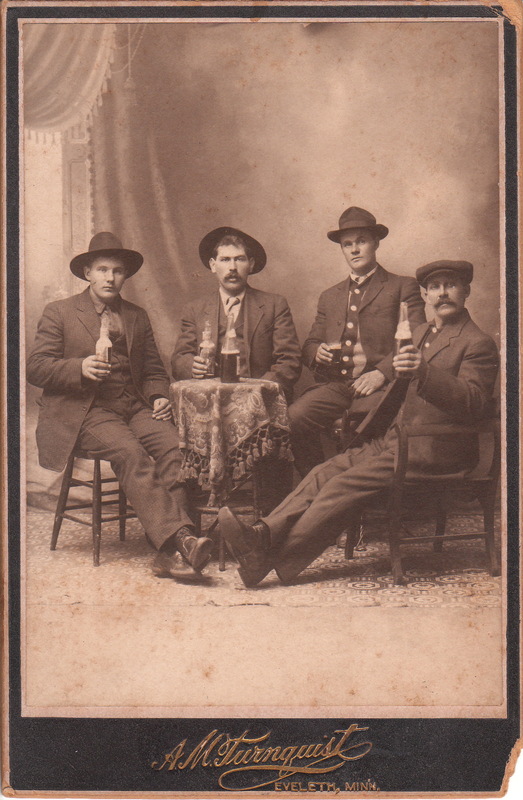 This Cabinet card depicts three guys out for a beer. They look like they are going to do some serious drinking and have a pitcher ready on the floor for refilling their glasses. The photograph was taken by F. W. Streit of Milwaukee, Wisconsin. How appropriate! Milwaukee is and was the unofficial beer capitol of the United States. The city was once the home to four of the world’s largest breweries and was the number one beer producing city in the world for many years.